MYANMAR Internal power struggle and Chinese interests behind Kachin "genocide"
Internal power struggle and Chinese interests behind Kachin "genocide"
Catholic activist denounces a humanitarian emergency involving tens of thousands of refugees. The government "does not want" peace with the ethnic group, criticism of Aung San Suu Kyi. Behind the war, China wants to protect its "business interests" in Myanmar. Appeal to the Pope and Christians throughout the world, for an end to violence. Yangon (AsiaNews) - In the state of Kachin - in the north of Myanmar, on the border with China - a real "genocide" is taking place perpetrated by the Burmese army through the use of heavy weapons and devastating air raids. The offensive against the ethnic minority and the rebel group testifies that "the government does not want peace," but "is following China's orders" for stability to protect its economic interests. The tragedy of the situation is revealed to AsiaNews by activist Khon Ja, Catholic, and member of the movement Kachin Peace Network, engaged in the pacification of the areas involved in the conflict and with an extensive knowledge of the regions. At the same time, the young woman appeals to Christians around the world to "support the suffering of the Kachin people" and the drama of "tens of thousands of displaced." The newspapers report that the Burmese army, supported by air cover, has gained a strategic position (Pojint-711 hill) and the areas surrounding the Laja Yang camp, until now in the hands of Kia militias (Kachin Independence Army). After months of almost absolute silence, even the newspapers now speak of a conflict that is increasingly bloody. As confirmed by military sources (and a video shown exclusively by AsiaNews), government forces also use the air raids to weaken the rebels. In their hunt they use Russian-made helicopters and Swedish mortars and rocket launchers. In spite of the appeals of the United Nations and ethnic Karen leaders - as well as another minority group, the Union of Myanmar - are calling for an end of the offensive and for peace talks, the situation remains complex. At stake is the delicate balance of power inside Burma and international economic interests. On the one hand, there is the so-called "reformist" government, which opened the country up to the West and the United States. On the other hand, the military leadership - which controls the Parliament and political life - that has established deep ties (including economic) with China, which has leveraged decades of embargo and sanctions to strengthen its position in the region. All at the expense of the people, the victim of a real "genocide" as confirmed by the Catholic activist Khon Ja. 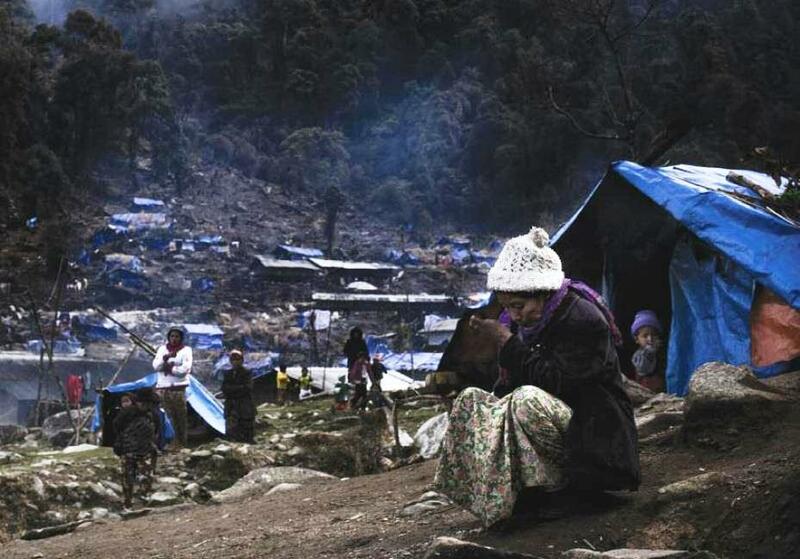 "We are on the eighth day of aerial bombardment" she confirmed to AsiaNews, and those suffering from the civilian population "already forced to endure the difficulties of the season, with temperatures down to minus six degrees in refugee camps in the north" Kachin State. There are also problems of basic supplies and food affecting "at least 50 thousand refugees," but the number could be higher. Charges are being laid against the army and "the government who do not want peace," but "follows China's orders" and those of investors who "demand security" in strategic areas of the economy, such as the State of Rakhine. Added to this is criticism of the behavior of Aung San Suu Kyi and other activists, who have "changed" in recent months to the point that they seem to be "bending to the will of President Thein Sein." Echoing the words of Pope Benedict XVI on the subject of peace, the Catholic activist finally addresses an appeal to Christians all over the world and the Vatican to "condemn the acts of violence" and support the population which is facing these tragic circumstances. The organization Kachin Kio "political" arm of the KIA is the only Burmese "rebel" group not to have signed a peace agreement with President Thein Sein and his government of "reform" since it came to power in March 2011. The violence resumed a few months later, in June, after 17 years of relative calm and have so far caused at least 75 thousand refugees and countless civilian casualties. At the base of the clash, the refusal of the Kachin leaders to abandon a "strategic position", which is located next to a major hydroelectric plant, the result of a joint agreement between China and Myanmar. For experts the confrontation with the Kachin, is the "number one problem" - in the long run - that the central government will have to address and resolve in a process of "democratization."